A cookbook that reinvents the American classic, macaroni and cheese, with gourmet ingredients, handcrafted artisan cheeses, and unique flavor combinations. 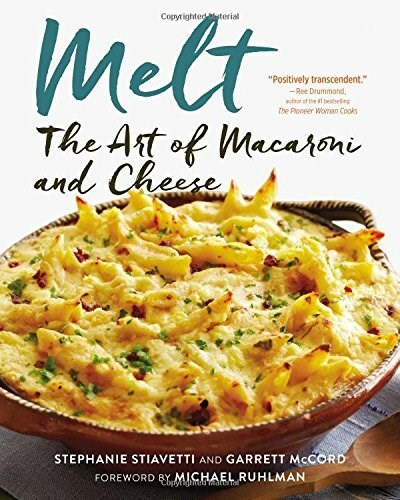 MELT: THE ART OF MACARONI AND CHEESE is the first book to marry the American standard, macaroni and cheese, with handcrafted artisan cheeses and a wide array of pastas, producing dishes that are both classic and chic. Home cooks of all levels will be encouraged to incorporate fresh, simple ingredients into the everyday comfort food they know and love. Featuring such unexpected and delicious combinations as Beecher's Flagship Cheddar with Avocado, Lime, and Shell Pasta; Drunken Goat, Fennel, Edamame, Mint, and Rotini; and Pumpkin Stuffed with Fontina, Italian Sausage, and Macaroni, MELT takes mac and cheese out of the box and elevates it to a level that will delight even the most sophisticated palates. With gorgeous color photography throughout, MELT is a compendium of inventive recipes that will add a fresh twist to the family dinner or play a starring role at your next dinner party.